Predictive maintenance is something we’ve been writing about a lot over the past number of years, as it’s an important part of running a successful maintenance management operation. Predictive maintenance, much like preventive maintenance, means you’re getting ahead of problems before they happen. However, the benefits of predictive maintenance can differ from other preventive maintenance strategies as a result monitoring the condition of the equipment in real-time, through vibration analysis or thermal imaging for example, rather than looking at average life expectancy statistics. By directly monitoring equipment for troubling signs through techniques such as this, technicians can proactively identify an impending machine failure before it happens and get ahead of the problem before it starts. 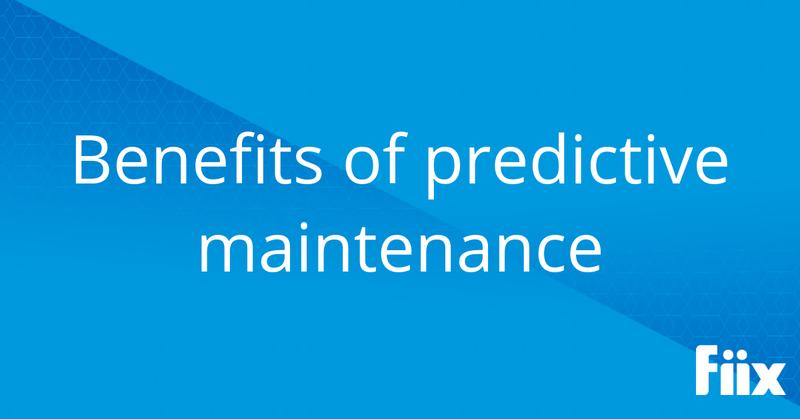 We asked Taylor Short, CMMS market researcher at Software Advice, for his take on the benefits of predictive maintenance which he shared with us below. The benefits of predictive maintenance (or PdM) are in its ability to drastically reduce machine downtime by providing the most up-to-the-minute condition data for assets. By streaming real-time data into a system directly from the machine itself, maintenance personnel can see when problems are forming and address them early, before they can cause costly downtime. Compared to reactive maintenance or even preventive maintenance, PdM offers the most proactive form of maintenance possible. While enhanced by using sensors mounted on machinery, the benefits of predictive maintenance can be achieved using handheld multimeters that many maintenance departments already possess. The software needed to perform this kind of maintenance is more affordable than ever. Since predictive maintenance utilizes real-time condition data, the frequency of machine downtime is minimized—when the asset data indicates a potential problem, the system will automatically create a work order and notify the appropriate technicians to perform work. This method saves companies money by reducing the chances of downtime and labor costs since assets are only repaired when the system notices a potential issue. In the past, predictive maintenance was only feasible for larger companies with big budgets. However, the software and technology associated with PdM has become affordable for almost any size company that wants to be as proactive as possible with maintenance work. Before implementing a predictive maintenance strategy, companies should have a clear business case in place to justify the investment. Organizations with lots of machinery that are critical to operations, such as those in manufacturing or healthcare, need to keep assets running for as long as possible. Determine the cost of machine downtime for your company and decide whether predictive maintenance is the best way to prevent that. Take a look at the Software Advice infographic about the benefits of predictive maintenance technologies here.